Copyright � 2006 by the Submitters. This document is available under the W3C Document License. See the W3C Intellectual Rights Notice and Legal Disclaimers for additional information. OWL 1.1 extends the W3C OWL Web Ontology Language with a small but useful set of features that have been requested by users, for which effective reasoning algorithms are now available, and that OWL tool developers are willing to support. The new features include extra syntactic sugar, additional property and qualified cardinality constructors, extended datatype support, simple metamodelling, and extended annotations. This document provides a specification of different families of sub-languages of OWL 1.1, for which the main reasoning problems can be decided in polynomial time. This document is intended to serve as a useful guideline for developers and users. Please send feedback to public-owl-dev@w3.org, which has a public archive. can handle at least some interesting inference service in polynomial time with respect to either the number of facts in the ontology or the size of the ontology as a whole. The list provided in this document is not meant to be exhaustive. The described logics have been recently identified by various groups of researchers. The interest of these logics to the OWL community relies on their nice scalability properties for certain reasoning tasks of special interest for Semantic Web applications. The goal of this document is to present these logics as sub-langages of OWL 1.1 and to describe their computational properties. Their semantics is provided directly by the semantics of OWL 1.1 [ OWL 1.1 Semantics ]. In this document, the parts of the language with no effect on the semantics, such as annotations, will be omitted for simplicity. The parts of the OWL 1.1 specification concerning datatypes have also been omitted, since the tractability results depend on the ability to reason within the datatype theory in polynomial time. In the case of the logic EL++ it has been shown that, if the datatype theory under consideration is decidable in polynomial time and is convex (see [ EL++ ] for details), then the combined complexity of the relevant reasoning problems remains polynomial. For the other logics presented in this document no explicit complexity results seem to be available. The definition of the non-terminal symbols objectPropertyExpression and description is different in each of the particular languages specified in this document. The EL++ logic [ EL++ ] eliminates the allValuesFrom restriction, retaining someValuesFrom, in order to obtain tractability. There are applications where allValues restrictions are not needed, and where the expressive power provided by EL++ seems sufficient. In particular, the medical ontology SNOMED and the Gene Ontology employ EL++. Large parts of the GALEN ontology can also be expressed in EL++. More details on EL++ can be found in [ EL++ ]. General Concept Inclusion axioms (GCIs). The language EL++, as presented here, is not a fragment of OWL DL, since it provides complex inclusion axioms on Object Properties. The fragment of EL++ that does not provide these axioms is indeed a fragment of OWL DL. EL++, as presented in this document, is slightly more restrictive than the language defined in [ EL++ ]; in particular, this document enforces the regularity condition on complex property inclusion axioms required in OWL 1.1. With this restriction, EL++ is a fragment of OWL 1.1. In what follows, a full specification of EL++ is provided. DL-Lite is a fragment of OWL DL especially tailored for handling efficiently large number of facts [ DL-Lite ]. The main focus is to provide efficient query answering on the data and to allow the use of Relational Database Managment technologies for such a purpose. inclusion axioms for object properties. The language DL-Lite, as presented here, is indeed a fragment of both OWL 1.1. and OWL DL. There are different variants of DL-Lite that have been described in the literature. The variant provided here is called DL-LiteR since it allows for property inclusion axioms. Other variants trade property inclusion axioms for functionality and inverse-functionality of object properties. Description Logic Programs [ DLP ] is a subset of both OWL DL and the Horn fragment of First Order Logic (with equality). In fact, the standard translation of DLP axioms to First Order Logic, as presented here, results into Horn clauses. Since DLP can be considered as a fragment of Horn logic, there is a connection, at least syntactic, with Logic Programs. However, it should be understood that; the logical consequences that an OWL 1.1 reasoner would draw from a DLP ontology differs from the ones that would be obtained using an LP engine. Typically, LP reasoners adopt the closed world assumption and are, consequently, non-monotonic. OWL 1.1, however, is monotonic and adopts the open-world assumption. DLP, as presented in this document, adopts the semantics of OWL 1.1 and not the semantics of LP. a limited form of General Concept Inclusion axioms (GCIs). [ Horn-SHIQ ] is a fragment of both Horn Logic and the Description Logic SHIQ. It is thus similar in spirit to DLP, although it is a different fragment of the intersection between OWL 1.1 and Horn Logic. The Horn-SHIQ language is not a fragment of OWL DL, since it allows qualified cardinality restrictions. For simplicity and ease of presentation, the definition provided here of the language is slightly more restrictive than the one proposed in [ Horn-SHIQ ]. subclass and equivalence relationships between named classes. The language does not allow complex class descriptions. Ontology Consistency: Check whether a given ontology has at least one model. Concept Satisfiability: Given an ontology O and a class A, verify whether there is a model of O in which the interpretation of A is a non-empty set. Instance Checking: Given an ontology, an individual a and a class A, verify whether a is an instance of A in every model of the ontology. Conjunctive Query Answering: Given an ontology O and a conjunctive query q, return the answers of the query with respect to O. Note that in languages that are propositionally closed (i.e. that provide, either implicitly or explicitly, conjunction, union and negation of class descriptions), such as OWL DL, OWL Lite and OWL 1.1, the problems of ontology consistency, concept satisfiability, concept subsumption and instance checking can be reduced to each other in polynomial time. However, none of the languages described in this document is propositionally closed and thus these reasoning problems may have different complexity and require diferent algorithmic solutions. The Data Complexity: the complexity measured with respect to the number of facts in the ontology. The Taxonomic complexity: the complexity measured with respect to the size of the axioms in the ontology. The Query Complexity: the complexity measured with respect to the number of conjuncts in the conjunctive query. The Combined Complexity: the complexity measured with respect to both the size of the axioms and the number of facts. In the case of conjunctive query answering, the combined complexity also includes the query complexity. Table 1 summarizes the known complexity results for OWL DL, OWL Lite, DL-Lite, EL++, DLP, Horn-SHIQ and RDF Schema. Whenever the complexity for a given problem is described as Open, with a star, (*), it is meant that its decidability is still an open question; if the star (*) is omitted, then the problem is known to be decidable but precise complexity bounds have not yet been established. If a problem is labeled as trivial, it is meant that the language is not expressive enough for allowing to different possible answers to the problem, e.g. every RDF Schema ontology is known to be consistent. The fact that data complexity stays LOGSPACE, means that one can exploit relational database technology for instance checking and conjunctive query answering.The fact that data complexity goes beyond LOGSPACE means that query answering and instance checking require more powerful engines than the ones provided by relational database technologies. PTIME-hardness essentially requires Datalog technologies. For the CoNP cases, Disjunctive Datalog technologies could be adopted. 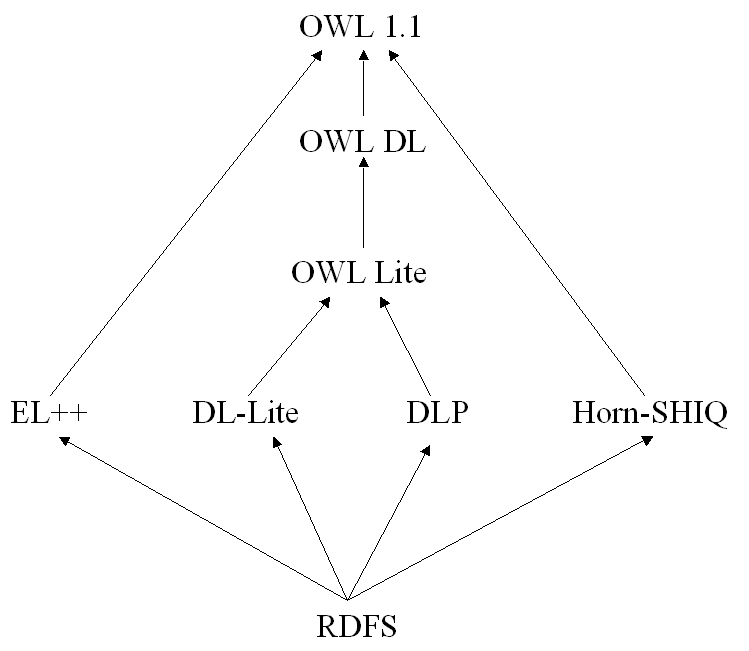 Figure 1 shows the relationship between the different languages mentioned in this document, including OWL DL, OWL 1.1 and OWL Lite. Two languages L1, L2 are connected by an arrow L1-->L2 if L1 is polynomially reducible to L2. The reader should note that in most of the cases the reduction is trivial, since L1 is just a syntactic fragment of L2 and thus every syntactically valid ontology written in L1 is also valid in L2. However,if L2 is OWL Lite, the reduction requires some work, since some of the constructs available in DL-Lite or DLP are not explicitly provided by OWL Lite. The reader should note that the absence of an arrow does not indicate that there is no reduction, not even that there is no easy one. The Description Logic Handbook . Franz Baader, Diego Calvanese, Deborah McGuinness, Daniele Nardi, Peter Patel-Schneider, eds., Cambridge University Press, 2003. Data Complexity in Very Expressive Description Logics . Ullrich Hustand, Boris Motik, and Ulrike Sattler. In Proc. of the 19th Joint Int. Conf. on Artificial Intelligence (IJCAI 2005), 2005. Description Logic Programs: Combining Logic Programs with Description Logics . Benjamin Grosof, Raphael Volz, Ian Horrocks and Stefan Decker. In Proc. of the 12th International World Wide Web Conference (WWW 2003), 2003. Tailoring OWL for Data Intensive Ontologies . Diego Calvanese, Giuseppe de Giacomo, Domenico Lembo, Maurizio Lenzerini, Riccardo Rosati. In Proceedings of the 1st OWL: Experiences and Directions Workshop (OWL-ED 2005), 2005.